The sixth edition of ‘Kingfisher Swimsuit Special’ (2008) was unveiled by Bollywood actor John Abraham along with UB Ltd Chairman Dr Vijay Mallya amidst a host of celebrities from the world of fashion, business and celluloid here. Shot by ace photographer Atul Kasbekar, the calendar features seven models. This year’s swimsuit special has some of the finest and most luxurious brands in the world including La Perla swimwear from their special ‘India inspired line’, shoes by Jimmy Choo, sunglasses by Roberto Cavalli, watches by Watches of Switzerland and accessories by Christian Dior. December 16, 2007. 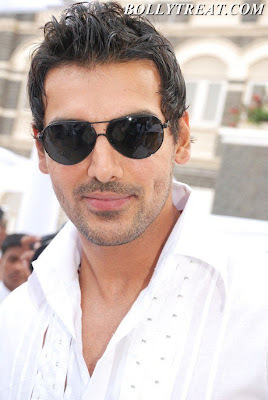 Bolly News, John Abraham. Leave a comment.